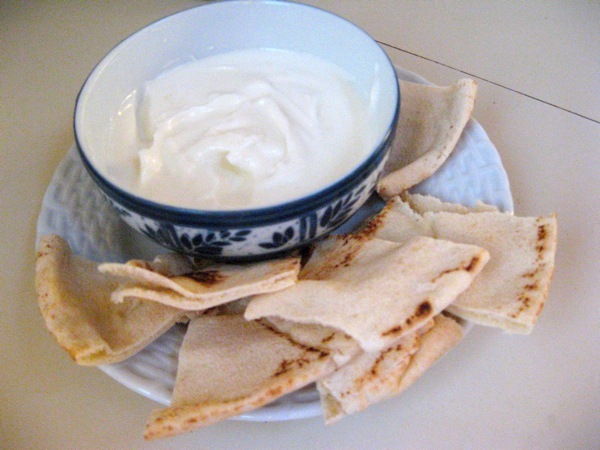 Toum (literally, “garlic” in Arabic) is a light, airy, and intensely garlicky dip that can be eaten with pita bread, chips, vegetables, or meat–if you make kebabs this summer, you should have it around. People who don’t care for garlic (and vampires) will be unimpressed. But if garlic is your jam, toum is like biting into a little, private cloud of Garlic Heaven. Note that the safflower oil cannot be substituted with olive oil. Olive oil is too heavy and will not allow the texture of the toum to get as light and fluffy as it needs to. Safflower (or sunflower or grapeseed) oil is much lighter, and investing in a bottle only takes a couple bucks and a little planning. Put garlic and 1 tablespoon of the safflower oil in a blender and blend at medium until they become a paste. There should be no large chunks of garlic remaining. Very slowly, drizzle 1/4 of the remaining safflower oil into the blender as it runs on medium. Equally slowly, drizzle 1 tablespoon of the lemon juice into the blender, still on medium. Repeat previous 2 steps two more times. This will leave you with roughly 1/4 cup of the safflower oil and a splash of the lemon juice, which will be added at the very end. Add salt into the running blender. Pour the chilled egg white into the blender. This will make the mixture suddenly very thick, so give the egg a minute in the running blender before moving onto the next step so the toum is properly whipped. Slowly pour in the last of the safflower oil and lemon juice. If mixture is still runny, add the ice water, one tablespoon at a time.